Robert Plant is the featured guest on the season 6 premiere of the AXS TV series The Big Interview With Dan Rather, and the program is streaming a preview of the episode ahead of its broadcast on Tuesday, March 13. The session sees the legendary rocker reflecting on his career as he promotes his latest effort, “Carry Fire”, while also discussing whether he considers music a profession, craft or art. “I think craft is the term I would use," explains Plant. "You grow into what might initially be an infatuation with the idea of entering something very special, very daring… Being attracted to the footlights and the entertainment and the smell of a venue and the anticipation in a crowd, I loved that. I thought that was an amazing thing, you know. I’ve been a music fan and a fan of all things that are interesting and occasionally unique, so I’m always a member of the audience and an entertainer, really. So, yeah, it’s a craft." 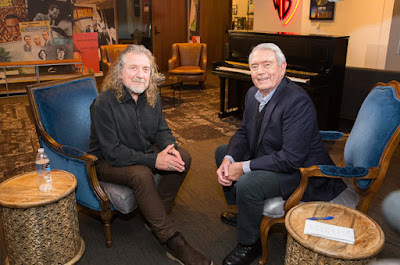 Plant’s appearance on The Big Interview With Dan Rather will premiere on AXS TV on Tuesday, March 13 at 9 p.m. ET / 6 p.m PT. Plant will begin an 8-date Australian tour with the first of three nights in Sydney on March 23.